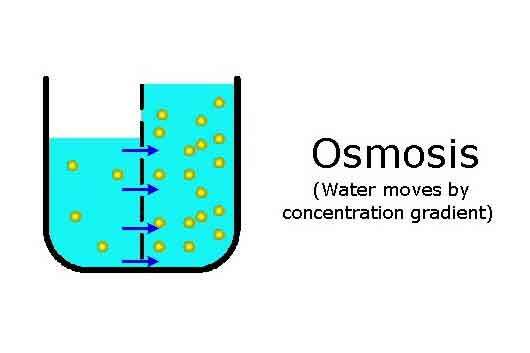 Osmosis is a process that allows molecules to pass through a semi-permeable c into higher concentration. Nature has the power to completely surprise and wow human beings. It has many processes that occur naturally, mostly to achieve equilibrium. Osmosis is one such process. In osmosis, a solvent moves across a semipermeable membrane from one solution to another. A solvent is any substance that dissolves something or can dissolve into something. Water is the most common type of solvent. Osmosis is a process where a solvent, such as water, moves across a semi-permeable membrane from a solution that has a lower concentration into a solution that has a higher concentration of the solute. Think of it this way, there are two solutions, one has 1tsp of salt in water, while the other has 5 tsp of salt in water. If these solutions are kept together, separated by a semi-permeable membrane, the water molecules would move from the solution containing 1tsp of salt to the solution containing 5 tsp of salt. It does this in order to establish equilibrium. So, in the end, the solution with the 5 tsp of salt would have more water than the solution with 1tsp of salt, until their solubility is the same.